Generally speaking, when a slots developers tosses the word ‘Cash’ into its game titles, the game turns out to have some generous bonus rounds and neat features. 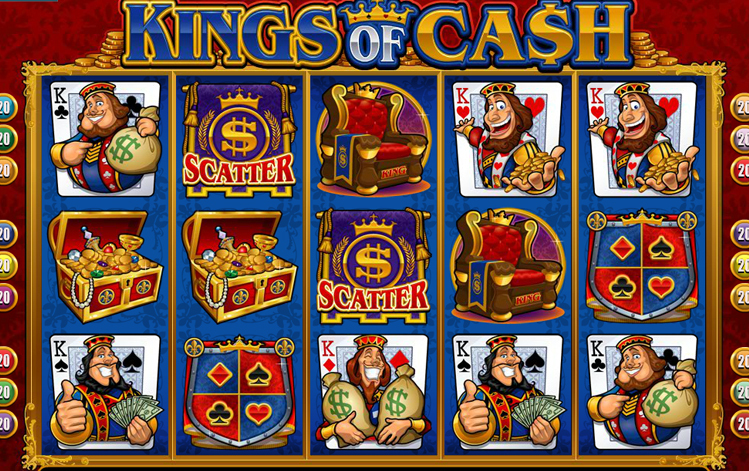 Microgaming’s medieval-themed slot, Kings of Cash, is certainly in that camp if its many bonus features are anything to by. 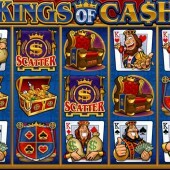 A 5 reel, 15 pay-line slot, the game has not one, but four king icons on the reels, each one representing a different playing card: king of clubs, king of spades, and so on. Elsewhere there are crowns, coats of arms, thrones and treasure chests overflowing with gold and jewels. Betting starts at just $0.01, but with 20 coins per line, there’s plenty of scope for bigger wagers. The game logo Wild symbol substitutes for all regular symbols other than the Scatters. Three or more gold dollar Scatters on the reels triggers a free spins round. 10 free spins can be won for hitting three Scatters, four Scatters will win you 15 spins, and five Scatters gets you the top whack of 25 spins. With those spins come a 2x multiplier, plus the conventional wins, 1x, 5x and 10x your total bet applied respectively. If free spins don’t float your boat, the extra bonus feature might. It’s triggered by hitting three or more crown Scatters anywhere on the reels, and when you hit you will trigger a basic Pick ‘em Bonus game. Here you get to choose from a selection of 12 playing cards. Keep picking until you match three kings of the same suit (clubs, spades, etc). In terms of color and graphics, there’s not much you can say against Microgaming’s fun slot. The playing cards theme is always a nice addition to any slots game, I feel, and the bonus rounds are attractive and came up a lot when I played. As for other medieval-themed slots online, check out two other Microgaming efforts: the Arthurian-tinged King Arthur game, and King Cashalot, which at least shares some of this game’s sense of fun.